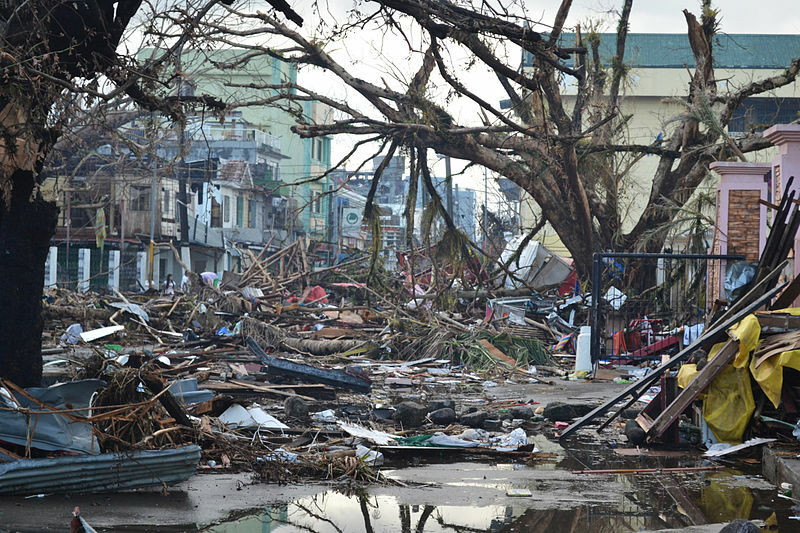 Debris lines the streets of Tacloban, Leyte island. Photo Credit: Wikimedia Commons. Today, as I write this, there are horrific scenes coming out of the Philippines in the wake of Typhoon Haiyan: complete devastation, bodies in makeshift graves, debris everywhere. The scenes out of America’s mid-west are also disturbing. Tornadoes ravaged Illinois and Indiana last weekend, however, thankfully the death toll was extremely low. 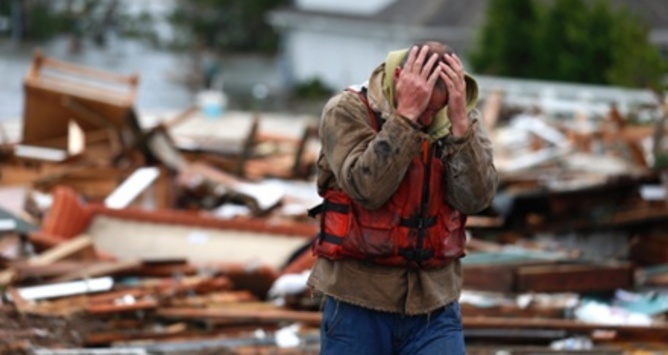 Natural disasters are especially hard to comprehend during the holiday season. Turn on the TV or radio (even the :15 ads on Pandora Radio), check your mailbox, pick up a newspaper, and you’ll be bombarded by ads promoting Black Friday specials. The Christmas holiday season however, doesn’t seem to be kicking off on Black Friday. Instead, it’s invading the turkey-induced peacefulness of Thanksgiving evening. Lots of stores are opening their doors Thursday night so that shoppers can allegedly get the best bargains. What happened to the meaning behind Thanksgiving, the thankfulness that we’re supposed to be honoring? So in the wake of natural disasters, death, devastation and the pure greed of Black Thursday/Friday shopping… I am offering a solution: being content. Last spring, I wrote about “the margins” in our lives (click here)—the need for unstructured time in which to breathe, reconnect with friends and family and simply “be.” I have since finished reading the book Margin: Restoring Emotional, Physical, Financial, and Time Reserves to Overloaded Lives by Richard A. Swenson, M.D. My women’s group had some awesome discussions that are still rattling around in my brain! One of the lasting impressions from this book is the idea of being “content.” What does it truly mean to be content? I thought I knew… but the book helped me to see contentedness in a new light. I know it’s a lot to absorb! But more and more, given the headlines, I am trying to be content, at peace, and thankful. One other area of my life has me examining this feeling of contentment. So many friends of mine are returning to work, driven by a desperate feeling that they need to earn money towards their children’s college fund(s). Let me tell you, as a parent of a college freshman, I can testify that the cost of college can indeed send you into a tailspin. And I don’t blame them for feeling this sense of desperation. However, I realize more and more that I am not living out “the norm” by stepping off the merry-go-round of crazy-paced, full-time employment while many of my friends are jumping back on that same carousel. Working for myself, enjoying a handful of clients and the work they send my way, has given me wonderful fulfillment, more time for my family and finally—some margin in my life. A combination of factors helps us afford the cost of college: yes, both of our jobs for which we are thankful, but also an examination of our family spending and our efforts to reduce those costs where we can—trimming our phone/cable bills, trimming grocery bills, cutting out extravagances, etc. This helps separate needs from wants. It’s a challenge, in our society, to be content with life and put complete faith in God. Food for thought, as we approach the Thanksgiving holiday. Wishing all of our readers a joyful, blessed Thanksgiving—filled with a renewed sense of contentment. 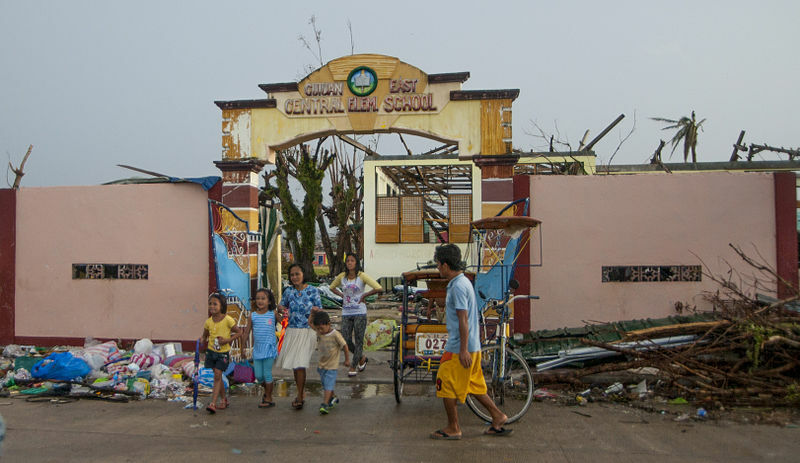 Philippine civilians walk out of what remains of the Guiuan East Central Elementary School in Guiuan, Philippines, Nov. 17, 2013. Photo Credit: Wikimedia Commons. 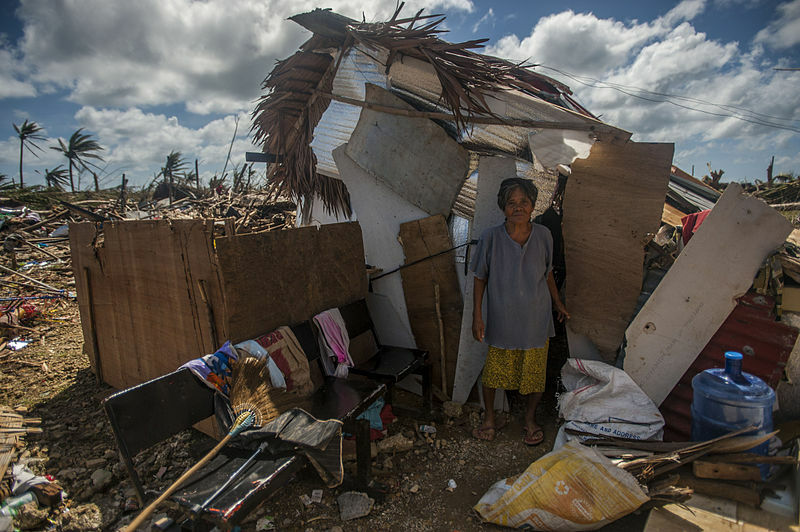 A Guiuan woman stands outside of her makeshift shack in the aftermath of Super Typhoon Haiyan. Photo Credit: Wikimedia Commons. 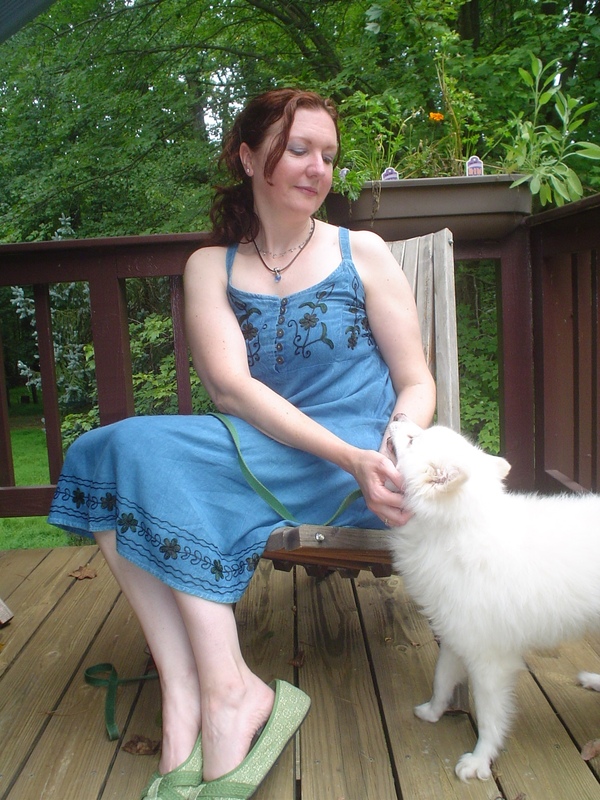 In my last blog, “Saying Goodbye to the Baby Years,” I mentioned that Kalli Dakos has a wonderful collection of “goodbye poems” to mark occasions of love, loss, and moving on (click here for her website). 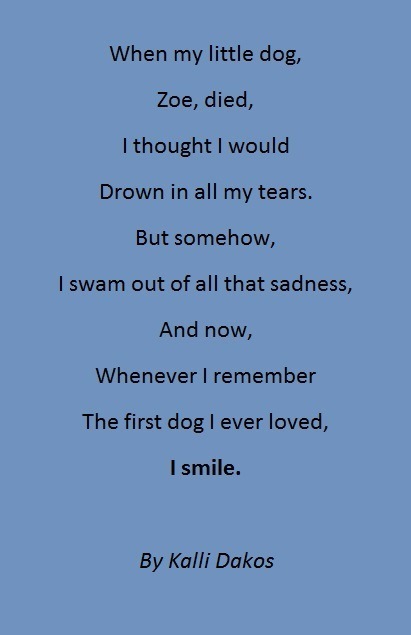 The poem above is a touching tribute to a beloved dog – missed by a child even into adulthood. When you have children, addressing the loss of a pet can be especially tricky for two reasons: you are demonstrating how grief in general is handled in your family, and you are building the foundation for how your child will cope with loss in the future. 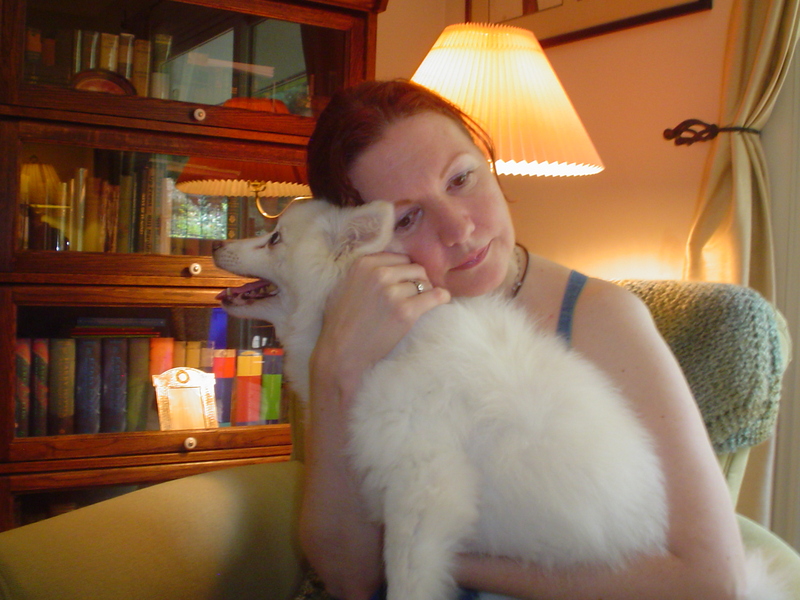 Several months ago, my family and I went through this process as we grieved the loss of our beloved American Eskimo dog, Bebe. I purchased Bebe in the late 1990s from a well run, local pet store where I lived in St. Petersburg, Florida. She saw me through a painful divorce, the sometimes loneliness of single life, and many career and personal adventures in between. 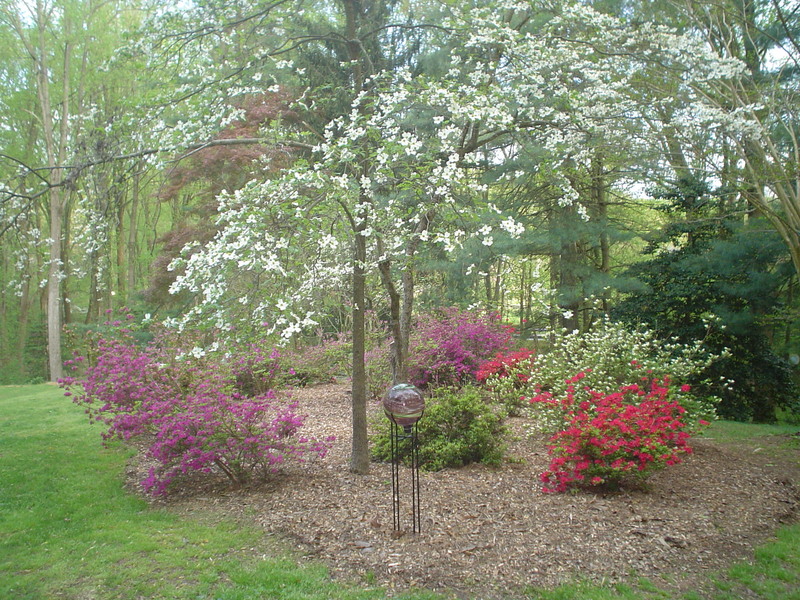 Although Bebe died several months prior, we celebrated her life this May in our lovely azalea garden with the flowers in full bloom. No matter how you choose to say goodbye to your pet, it is important to find some way to commemorate the life of the beautiful creature that brought sunshine to your days. Below are a few suggestions for saying goodbye to your pet – no matter what kind of a pet you have. * If you have the opportunity, spend last moments of quiet time together. Hold your pet, talk with your pet, cry with your pet. These final memories will be good ones to hold onto after your pet is gone. The evening before I had to take Bebe to the veterinarian to put her to sleep, my husband watched my son so she and I could just be together. I petted her, held her, talked openly with her, and cried – a lot. We even took final pictures of her with us. I am so glad I spent that final time with her and will treasure it always. * Talk with others. Sometimes we may feel a bit embarrassed, even “silly,” when we grieve our pet. Yet remember that many people share your feelings. You may have heard someone refer to their pet as a “member of the family.” Pets can indeed touch our lives in some profound ways. Talking about how you feel with others will help you see that your sentiments are echoed by many. You are not alone! *Address the loss openly and with great sensitivity. If this is your children’s first experience with death you definitely want to handle it well since it will likely have a lasting impact on their lives. It may be difficult to refrain from cracking a smile when having to flush a little belly-up guppy down the toilet, yet if you treat this time seriously and guide your children through the grieving process they hopefully will develop coping skills for future losses. * Include the entire family in the grieving process. This is very important in order to help your children and other family members find closure. No matter how old your children, they can participate in some way. Of course for an infant it may simply be that they are being held in your arms during the goodbyes, and can look back on pictures of the day when the family discusses the event in the future. In this way, they will see that their presence was valued during that time as well. Older children can have more involved roles, depending upon their age. * Hold a remembrance ceremony or memorial service. Every family will handle this differently. 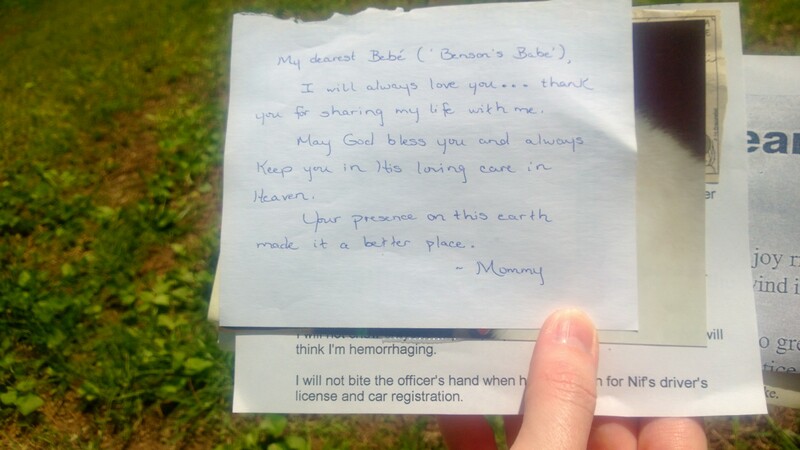 Some purchase a burial plot in a pet cemetery; others mark a special place in their backyard for burying a memory box. Still others have their pet cremated and display the ashes in a beautiful container or box. If allowing a veterinary hospital handle all of the arrangements, and no ashes or memory marker is going to be received, a family may just wish to set aside time one day for sharing memories of their pet. Hold a special memorial service and involve all the members of your family – no matter how young. * The way you say goodbye does not have to be extravagant to be meaningful. There is no “right” way to say goodbye, nor one way over another that will make the loss any easier. In acknowledging the life of your pet, you need to choose a way that feels good to you and works for your family. Perhaps you have the money for a burial plot in a pet cemetery and feel that is a special tribute. Just know that it is not necessary to go to such great expense and effort to say goodbye to your pet. The way you say goodbye is not as important as the meaning behind whatever way you choose. * Establish a permanent “marker” for your pet. Again, this does not have to be an expensive item – rather just something for you and your family to look at, touch, visit, and talk to. Something solid that allows you to “communicate” with, and remember, your pet during the times you miss her. Sometimes time doesn’t heal all wounds and it is nice to have a more tangible way to reminisce about your pet outside of recalling fond memories. My family chose to keep Bebe’s beautiful wooden ashes box on our display case rather than bury it. 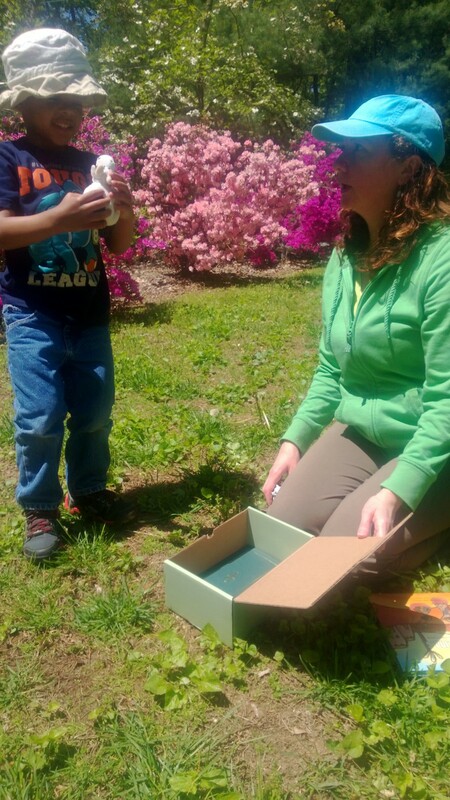 Instead, we buried a box full of memorable items from her life in our azalea garden. We marked the “grave” site with a fairly large, flat rock and placed a small outdoor dog statue of an American Eskimo on top of that. 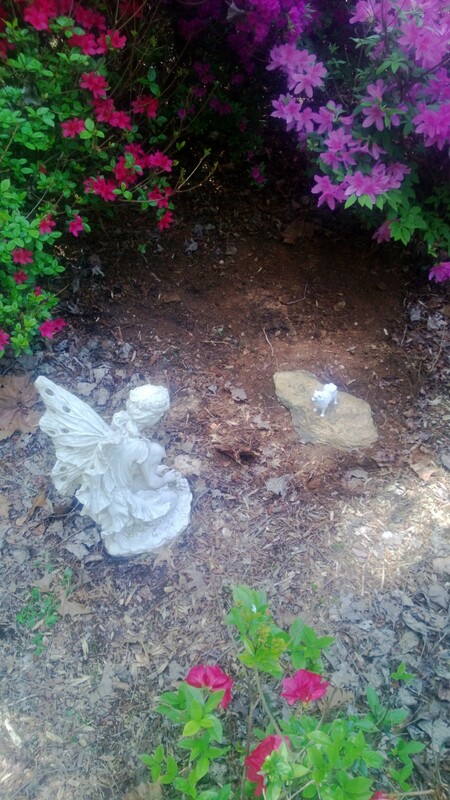 Her resting place is watched over by our garden fairy, Fiona. * Invite whomever you like. Your ceremony can be small and intimate, perhaps just the members of your immediate family as ours was for Bebe, or you can open the memorial service to extended family and even good friends. Invite whomever you are comfortable sharing the occasion with as well as whomever will be supportive of you during this difficult time. *Plan ahead. Of course all pets will die eventually. Just as we often begin planning for our passing before it happens, the grieving process and saying goodbye to our pets can be made easier if we know how we are going to handle that time when it comes. Saying goodbye to a pet is typically not easy yet by having a plan in place for doing so with your family, finding a special way to honor the memory of your pet, and helping your children deal with their loss you can certainly get through it. Please share how you handled the loss of a pet with your family – how you coped, or a special way you remembered the life of your pet. 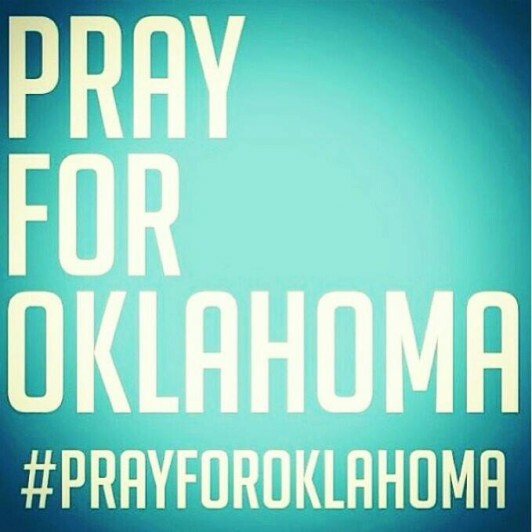 Prayers and thoughts are with everyone whose lives were suddenly affected by tornadoes in Oklahoma yesterday. The images, the loss of life, the stories, and the destruction are all difficult to comprehend. The fact that many of the victims are children is heart-breaking. I heard the lieutenant governor of Oklahoma being interviewed last night on national television and he spoke to the fact that Oklahoma residents will survive this tragedy since they are people of great faith, having been through many previous tornadoes and other disasters such as the Oklahoma City bombing. It is impossible to understand how and why natural disasters happen, but having faith can help you move on and look ahead. Our God is a God of peace. Where there is division, walls, hostility, God reconciles us together. Heals us. Our God is a God who mends. Making what was once a million pieces into one complete whole. Our God is a God of comfort. When we are afraid, scared of our own shadow, God is close. Closer to us than the air we breathe. Speaking words of peace, ‘Be still, dear one.’ Peace is with you. Our God is a God of life, calling each of us to live in the hope of a new humanity shaped not by fear, but by the peace of Christ. Truth is: you may still be afraid and that’s okay. May all those whose lives were ripped apart by Oklahoma’s tornadoes take comfort in the enveloping love of God’s embrace today and in the days to come. May we reach out as we’re able and lend a helping hand. As I sat down to put the finishing touches on what I thought would be my next blog, I just couldn’t bring myself to complete it. I was writing about meal planning and preparation. However, in the wake of Hurricane Sandy and an election that has divided our great country seemingly right down the middle, it just didn’t seem fitting or proper to blog on such a mundane topic. Instead, I thought that we all might benefit from gaining some perspective. While reading news items online regarding the hurricane victims, I saw an image of two elderly people rooting through a dumpster for food and was brought to tears. How humbling of an experience that must have been. Perhaps there was a time just a few short weeks ago that they had plenty or even an abundance of food to eat. Then, I got to thinking that for some of our fellow Americans this is indeed a normal occurrence. 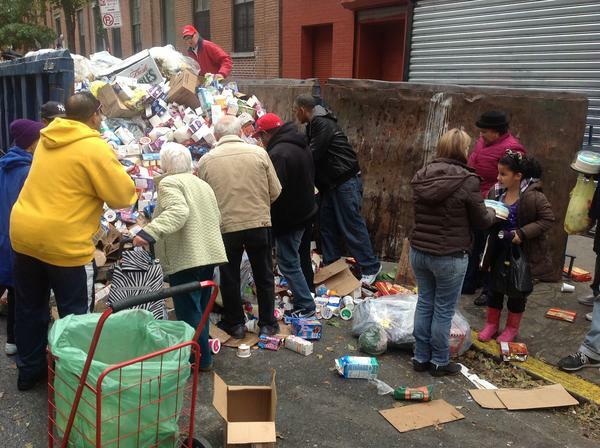 (Photo Credit: Jonathan Vigliotti, Twitter) Desperate families in East Village dumpster dive for discarded groceries. 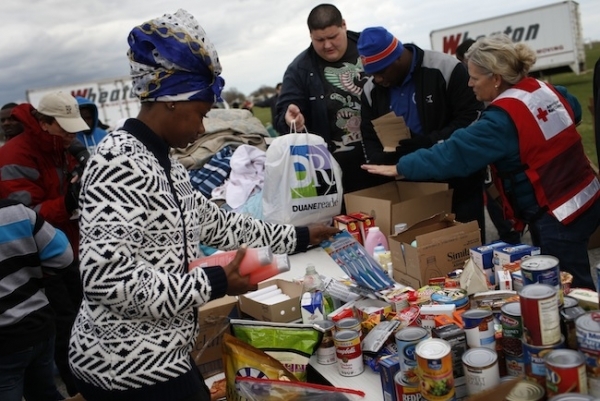 (Photo Credit: Reuters) Hurricane Sandy victims are helped by a volunteer to load food and other items from a FEMA and American Red Cross aid and disaster relief station in the hard-hit Staten Island section of New York City November 2, 2012. (Photo Credit: KatieCouric.com) Jon Bon Jovi makes sandwiches for hurricane victims at his soup kitchen in Red Bank, NJ. Admittedly, there are times when I struggle to prepare meals. Not because my family lacks resources, but because we’re spoiled. Our children have had the luxury of picking and choosing what they “like” to eat rather than eating because they are hungry. Of course, they will tell you that they are “starving” and want to know when dinner will be ready. But, in truth, they do not know what it is to go hungry; nor do I for that matter. Seeing people in these hurricane ravaged areas who have perhaps never gone hungry a day in their life, has given me something to consider as I catch myself “complaining” about food preparation. Don’t get me wrong, I love to cook, but my biggest dilemma is what to have for dinner. Now that seems so trivial and ridiculous. When considering others who are less fortunate, there are other domestic duties that can be thought of with a new perspective. For example, when I go into my laundry room and the laundry is piled to the ceiling, I can look at that pile in a new light. My family is well clothed. If any one of the members of my family was no longer with us, I would not have as much laundry, but would that be better? I have the resources of clean water and a washer and dryer. For many in our country and world, these basic needs are not met. Photo Credit: David Handschuh, New York Daily News. Photographer David Handschuh explains just how devastating this storm has been for the New York City community. “I’ve covered earthquakes, hurricanes and a slew of disasters both man made and natural around the world for the Daily News over the last 25 years, but the level of damage and the amount of destruction I witnessed in Breezy Point, the Rockaways and along Cross Bay Blvd. 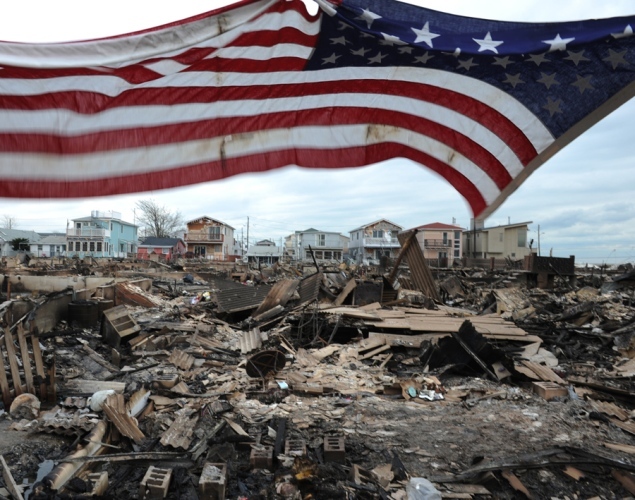 is of unbelievable proportion.” Here, some of that damage is seen in Breezy Point on Nov. 1, 2012. There is another area that I believe we all might benefit from some perspective. How about the recent election? Did your “man” win? As I’m writing this, our country does not yet know who will be our president the next four years. Regardless of the outcome, I hope that all of you will consider that there are countries in our world that don’t have the right to vote. Recently, I read that the Chinese delight in speculating whether President Barack Obama will fend off Republican challenger Mitt Romney, but they are more captivated by Americans’ ability to vote for their leader. Their own leaders are distant figures whom they have no way of replacing.” (US Election Fascinates Chinese; some envy voters, 11/5/12, Didi Tang, Associated Press). We have the right to vote for the leader of our country, and if we don’t like the outcome we have another opportunity to make a change in four years. Before I close, I just want to mention that one of the greatest ways to change your perspective is to take action. This time of year presents many opportunities to reach out to others who are less fortunate by giving of your time, talent or resources. Please consider doing what you can to ease the suffering of our fellow human beings. For example, to donate to the victims of Hurricane Sandy, via the Red Cross, click here. In a little over two weeks’ time we will be gathering around the Thanksgiving table and reflecting on that for which we are thankful. My hope is that you won’t wait until that time to think about all of the blessings in your life. Change your perspective and remember, “someone else is happy with less than what you have.” (author unknown).